The assassination of Gdańsk Mayor Paweł Adamowicz at the hands of a deranged ex-con did not occur in a vacuum. It cannot be separated from the degeneration of public discourse in Poland under the Law and Justice (PiS) government – or from the anti-European nationalism embodied by the PiS and similar parties elsewhere. BRUSSELS – As the birthplace of Solidarity, the movement that helped bring communism to an end in Europe, Gdańsk has long served as a symbol of freedom and openness. But now the city is coping with the assassination on January 13 of its mayor, Paweł Adamowicz. Simply writing that sentence is a surreal and painful experience for me. The question is what consequences his public murder will have for Poland – and for Europe. Adamowicz had been the subject of repeated political attacks in recent years. Because he was a tough leader with strong support in Gdańsk and beyond, his enemies pulled out all the stops to malign his reputation. But he was not alone. Since the Law and Justice (PiS) party came to power in 2015, European Council President Donald Tusk, judges such as Andrzej Rzepliński and Małgorzata Gersdorf, and even the charity founder Jerzy Owsiak have all been targeted with shameless smear campaigns by the state-run media. Polish politics has reached a point where dehumanizing one’s opponents is the surest route to victory. In the case of the PiS, such adversaries include not just opposition parties, but also immigrants, independent judges, and average citizens protesting abuses of power. Tactics that were once used only by gutter tabloids have now gone mainstream. Meanwhile, in Gdańsk and other cities, young nationalists have begun publishing fake “death certificates” of politicians such as Adamowicz. In Katowice, portraits of “unpatriotic” MEPs are hung from gallows. Citing “negligible social harm,” prosecutors do not bother to investigate these threats. Apparently, young neo-fascists should be allowed to sow their wild oats. In fact, the leading loudmouths of the far-right National Radical Camp (ONR) march with police protection. And while independent cultural institutions such as theaters and museums are shuttered, pro-Russian fundamentalist organizations are allowed to prosper. It was in this hysterical, xenophobic political atmosphere that a recently released convict – most likely suffering from a mental disorder – ran onstage during a benefit concert for Owsiak’s charity and plunged a knife into Adamowicz’s heart. I, for one, refuse to believe that the killer’s actions had nothing to do with the hate-filled rhetoric to which he has been exposed since leaving prison. 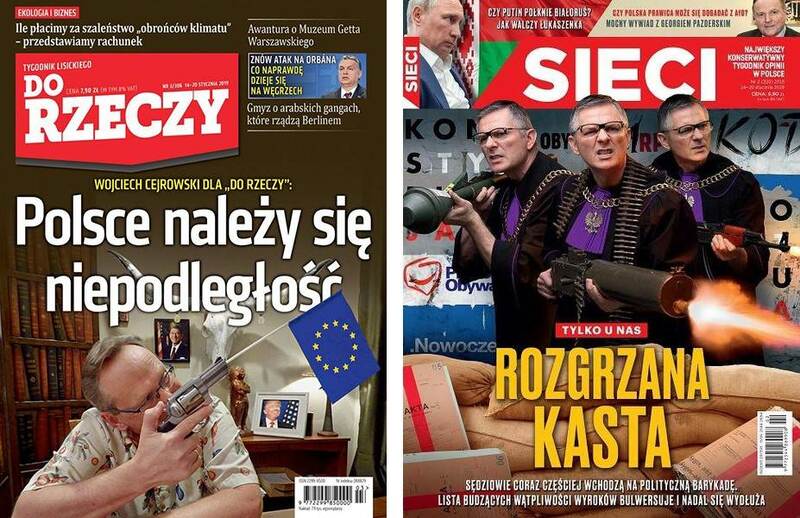 After all, on the day Adamowicz died, two alt-right weeklies featured covers essentially declaring war on Poland’s judiciary and the European Union. Such messages must have a damaging effect on the psyches of disturbed and impressionable people like Adamowicz’s killer. A man who goes from the isolation of prison to a media environment saturated with incitements to violence is practically defenseless against propaganda. When he hears “death to the enemies of the Fatherland,” there is a good chance that he will take those words literally. Those now mourning Adamowicz should not fool themselves into thinking his murder happened in a vacuum. Willful acts of collective amnesia and whispers to “keep quiet over this coffin” will not do. Now is the time to get angry and express our moral outrage over the direction of Polish politics and public life. All Poles who still believe in freedom and openness must make themselves heard loud and clear that we will not succumb to threats and blackmail from extremists, including those in the government. In confronting today’s morbid, state-sponsored hysteria, Polish citizens have no choice but to stand in total opposition to the political status quo. They should do so not in shame, but with pride. Polish democracy is under attack and must be defended with the same vigor as that of those who seek to destroy it. We must defend liberal politicians, free media, independent judges, and activists such as Władysław Frasyniuk, Klementyna Suchanow, and Paweł Kasprzak – all of whom are now under sustained attack. Hate speech and threats to liberal values are not confined to Poland. Across the EU, one in four voters now supports populist parties. And without bothering to ask for the public’s consent, Poland’s government has formed an “axis” with Italy’s likeminded government, in order to provide a populist “counterweight” to the governments committed to liberal democratic values. This unity among illiberal governments is part of a larger populist project aimed at capturing – and potentially destroying – the EU by prevailing in the European Parliament elections this May. The commitment to liberal democratic values has long driven the European project forward. But a new axis of troublemakers now wants to derail it. To ensure that they do not succeed, Europeans must show the same courage and resolve as Adamowicz did throughout his career. Jan 17, 2019 Sławomir Sierakowski sees in the public murder of the city's mayor the predictable result of the ruling party's political tactics. This link may give a focal point, that can begin a discussion platform as to the real complex issue that is developing that is really the underlying cause for the anomaly in behavior extremes. Unfortunately because of political, and short-term opportunism, the reactive behavior that is really rooted in the mass emotional reaction to the mass experience of "mass surveillance" is being manipulated due to "take-away-talking-points" by highly skilled strategists and stake-holders. Then, the real problem is never examined. The "problem of mass surveillance due to global internet business operations based on software applications/platforms designed for capitalizing from theft of personal data" is THE problem that is being ignored globally by all participants on all levels of society, especially, and practically every economist that is earning an income while labelling themselves "economists". That is the real problem affecting the global economy presently. The secondary problem affecting the global economy is the failure to establish international law, with reasonable process to enforce the law, of equality for women. Any political leader that exhibits valid focused goals for the people will be destroyed. That type of leader would destroy the corrupt application models. The corrupt business model is fighting for survival. The individual assassin really doesn't matter. The individual political leader really doesn't matter. The systemic model is presently quite successful. The total operating dynamics on the systemic level is more powerful than the incidental actions of any of the human beings. Until the systemic model is effectively changed, there will be more "acting out" by unwitting and unfortunately ignorant human beings caught in the "dysfunctions" of the superficial web, its underlying global computer networking infrastructure and telecommunications architecture, including satellites, underground, and underwater media. Any human dynamics are basically powerless and functioning in a completely different arena, one could say "platforms" of reality. A spectre is haunting Europe — the spectre of fascism. Let's hope this is not too little, too late. It would be quite something to start this cycle all over again, this time with a bucket of nukes, ready to launch.